Finally managed to design one I'm happy with! 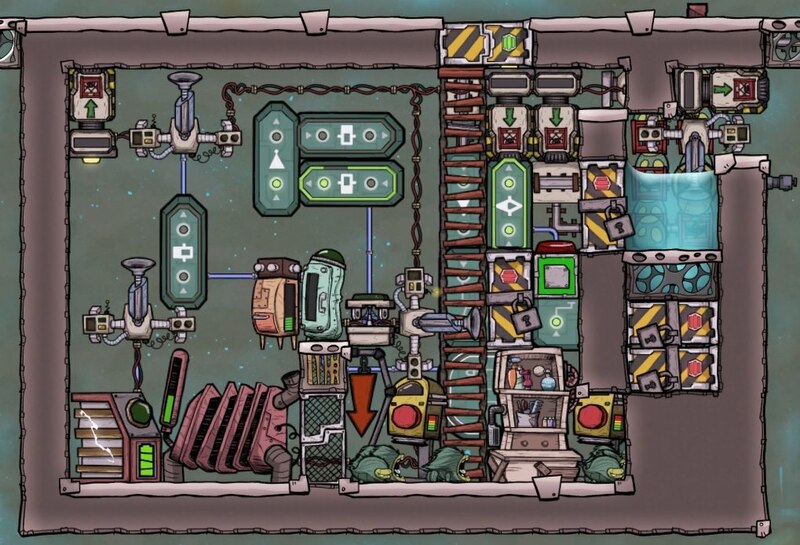 An (Almost) Set-And-Forget Automated Hatch Ranch. Regardless, the build consumes grooming time and hatch food, and outputs eggs, meat and coal while automatically maintaining the stables hatch population (or at least, trying to). It works pretty well: there are a few edge cases that can cause the stable population to drop by one (two hatches dying before a new hatchling is born, hatches running out of food and resorting to cannibalism the next time one of them dies...), but dropping in to check the population on on of these every hundred cycles or so is a heck of a lot less work than continually monitoring the stable population yourself. So I'm going to consider it a success, albeit a tentative one! Nothing special about the power overlay. 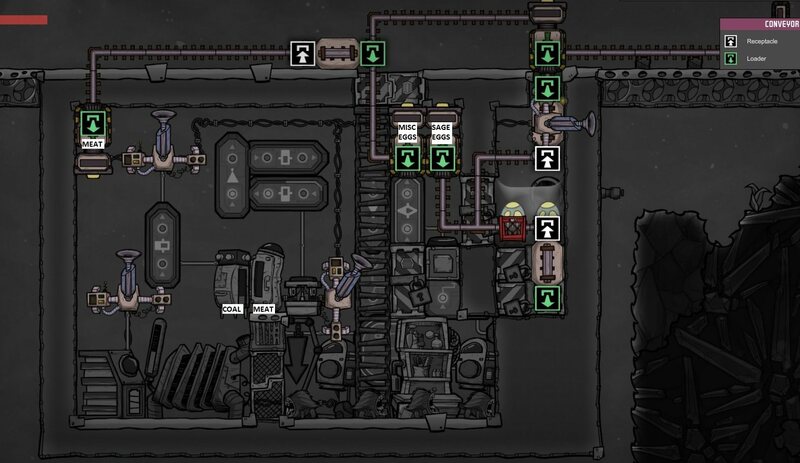 It uses about 12 watts on average (the fridge is connected to an automation timer that turns it on for 2 seconds out of every 20), with the occasional very brief spike of power when things need to be moved or shipped, so it can be easily powered by the coal generated by the hatches. 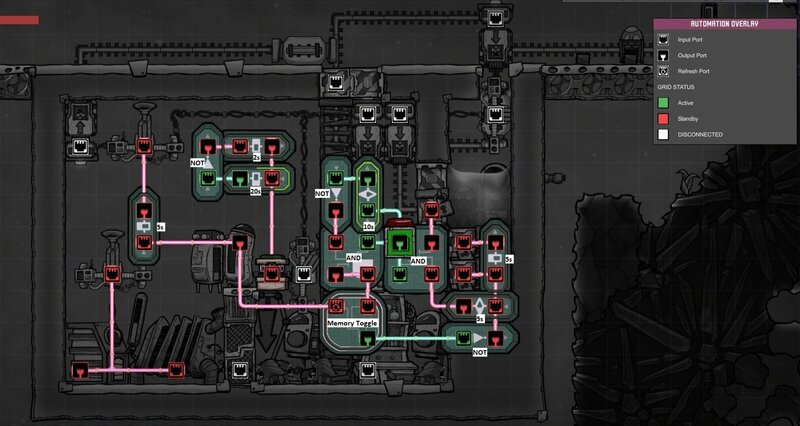 You can add your own coal loader to the design if you want to ship coal out, and take out the generator and battery entirely if you'd rather run it from your main grid. 1. The stable floor is continually monitored by the autosweeper in the middle, which loads up 2 conveyor loaders (Sage Eggs/Misc Eggs) a fridge (meat) and a storage compactor (coal). 2. Sage eggs are split between being exported to the kitchen (conveyor rail going offscreen, top right) and sent to the hatchery. Only two eggs can be hatched at a time, since they have to be hatched on the same level as the floor or they fall through open doors into the water tank, even when the hatchery is not in MURDER MODE. 3. Other eggs are sent directly to the kitchen. Do not pass go, do not collect $200. 4. Meat goes into the fridge, which has a maximum of 1kg. 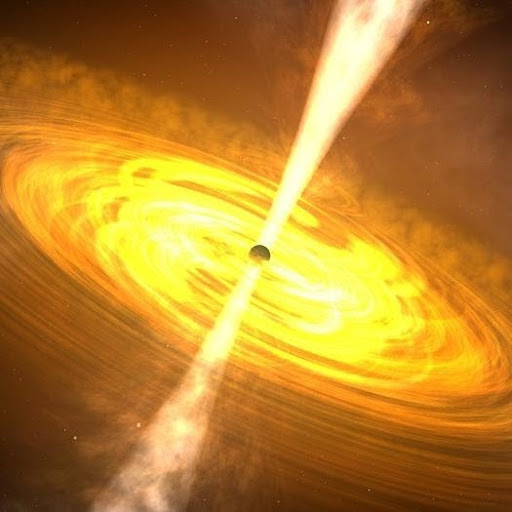 It immediately becomes full and sends a signal that an adult hatch has died and needs to be replaced. The meat is then transferred to the kitchen via the meat conveyor loader (top left). The meat conveyor loader needs to have a higher priority than the fridge. Also, the critter feeders should not offer meat as part of the sage hatches diet. 5. Coal is put in the coal generator when it needs it: the generator needs to have a higher priority than the storage compactor. Make sure to increase the batteries minimum from 0, since the sweeper needs power to fill up the generator. 1. The memory toggle controls the Hatchery's behaviour. In MERCY MODE, it remembers that an adult hatch has died recently, and spares any hatchlings that are born. The happy little sageballs will be allowed to leave and dropped into the stable. 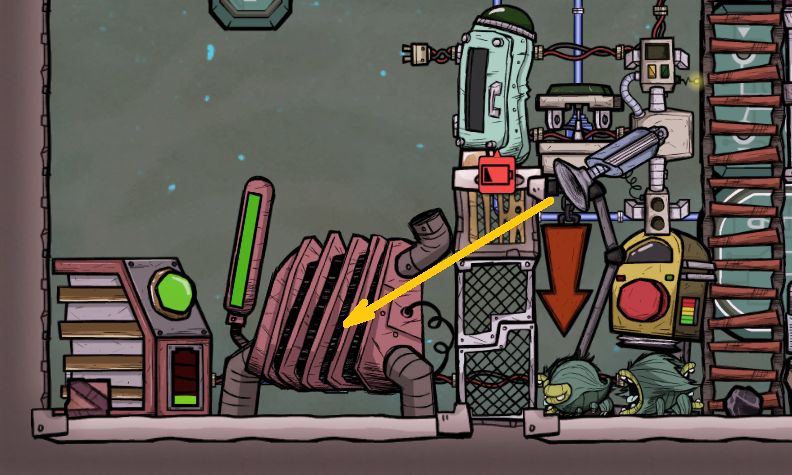 The door between the hatchery and the stable closes as soon as they step on the weightplate to prevent them from pathing back into the hatchery. 2. Upon dropping a hatchling, the hatchery resets to MURDER MODE, which is the default (because of course it is). The door is closed, the water is pushed up, and the adorable little hatchlings are born underwater and spend their brief existence suffering tragically before the sweet embrace of death. The meat is then swept away to the kitchens. And yes, I can confirm from my own testing that eggs can hatch underwater. Discovering that little factoid saved me a lot of hassle. I've included the build in a yaml file. It doesn't work properly (conveyor rails are broken and none of the building settings are copied with it), but it should save you the hassle of rebuilding everything if you want to play around with it in debug mode. I can't promise it'll work in all situations: I've tested it for many cycles in debug mode, and through saving/loading, but there's always the potential for edge cases. Even if it doesn't work, I hope it at least gives you some idea's for your own ranching efforts. Good job. 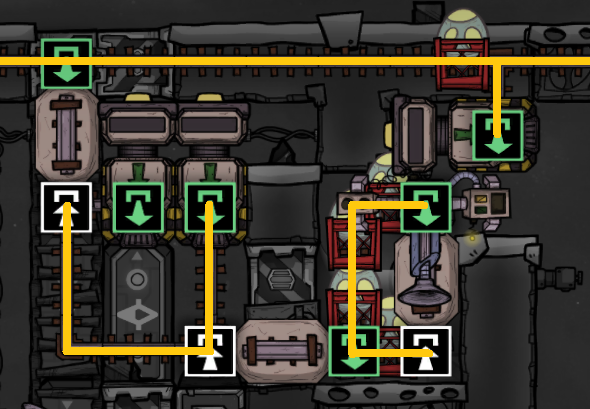 I stopped on similiar design when I realized the same thing about double dying hatch (and found that bug with sweeper and weight plate). And what about eggs on rails? It is possible you will have 2 eggs on rails when mercy mode begins? 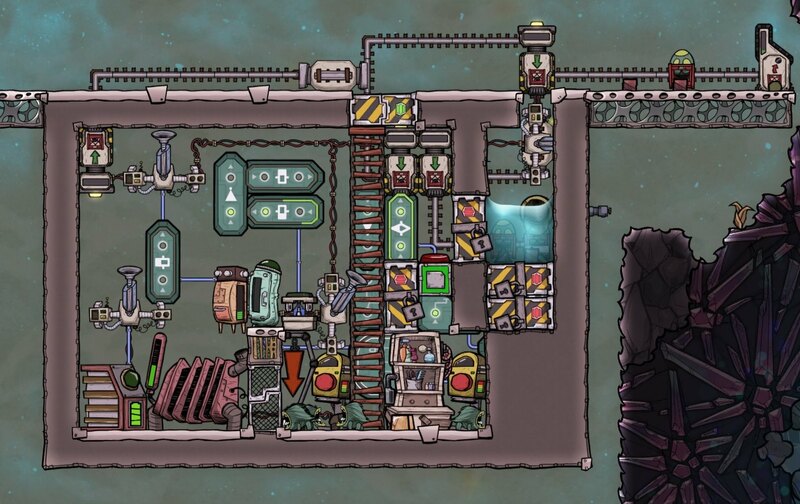 Anyway, I still want fully automated ranch without checking it even 1 cycle of 100 (aka "self-sustainable base"). But for "survival mode" it's great! Mercy mode ends as soon as one of them exits the hatchery, so unless they both hatch and pathfind out in perfect unison (which is unlikely), the count will be maintained. Hmm... I just spotted some minor changes that could allow it to support more eggs in the hatchery (by lowering the water tank a tile and putting in mesh tiles, and recouping the cost to stable space at the top of the hatchery). More eggs in the hatchery means less wait time for one to hatch, which reduces the possibility of an adult hatch dying before a new baby is added. It also means more meat at the cost of fewer eggs, so I suppose it's up to the person building it how much egg space they want to include. I should probably also try to get that meat loader and those shipping bridges inside the builds footprint. It looks awkward having them outside the rectangle. The hatchery can now hold 7 eggs instead of two, thanks to the addition of mesh tiles to prevent hatchlings from falling into the water tank. This means more meat (and less eggs), but more importantly, it vastly reduces the chance of two hatches dying before a new one is born. First, I like your design. Second I did not have time to test it. 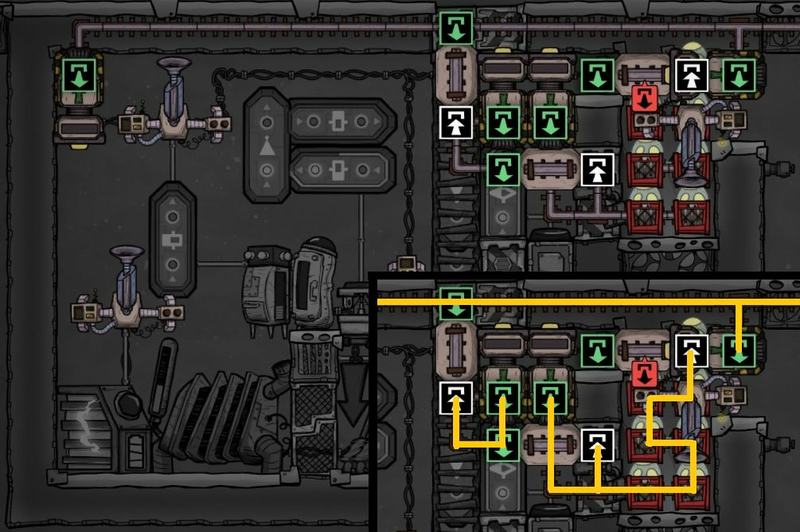 There is a potential problem with the dead end for your eggs (which I had in my build). Once the eggs hatch, the empty basket may stay behind and will block any new eggs coming in the rail. Kabrute showed me, that a loop through a bridge will remove the empty cages. 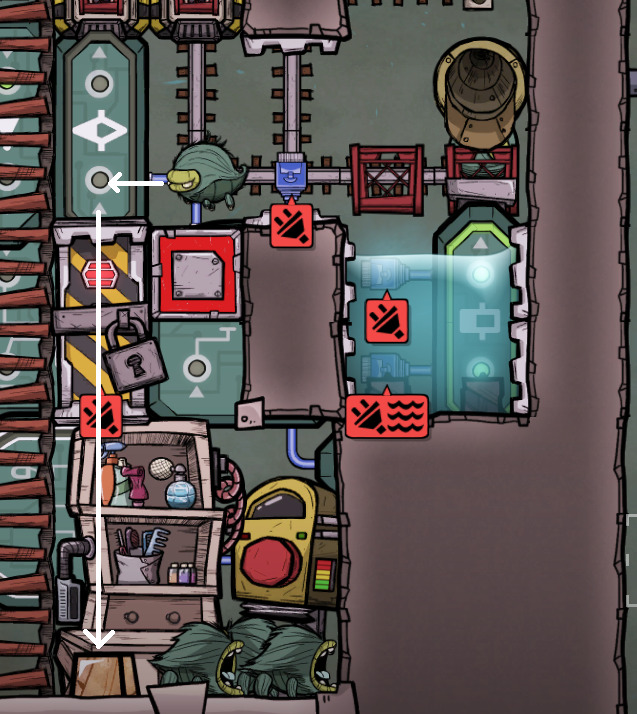 How well would this continue to work if you raised the Storage Compactor up by 1 tile, in order to put a Tile under it to get around the bizarre floating behavior (that most certainly is a bug)? It shouldn't block any Sweeper arms, but you'd have to account for that 1 Tile space to prevent Overcrowding. The only available space I see is the bottom tile next to the Critter Feeder, but that would lead to occasional Coal "deposits" being out of range of the Sweeper arm servicing the Compactor we're moving from the Hatch side. Hmm... the empty cages might reset when you save/load the game, which would explain why I never had any real problems with it. 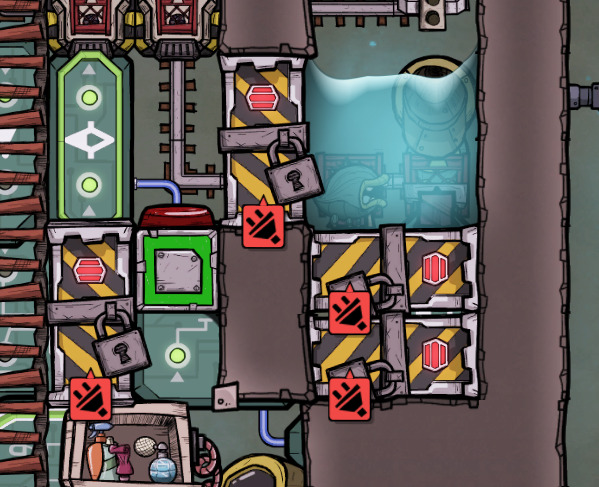 Addressing this cleans up the shipping, though it also means reducing the size of the hatchery to 4 eggs (I don't know what would happen if I hatched a hatch inside the tile at the top. Not really keen on finding out). Ha! The coal sweeper and receptacle is completely unnecessary! The stable sweeper can take care of it. 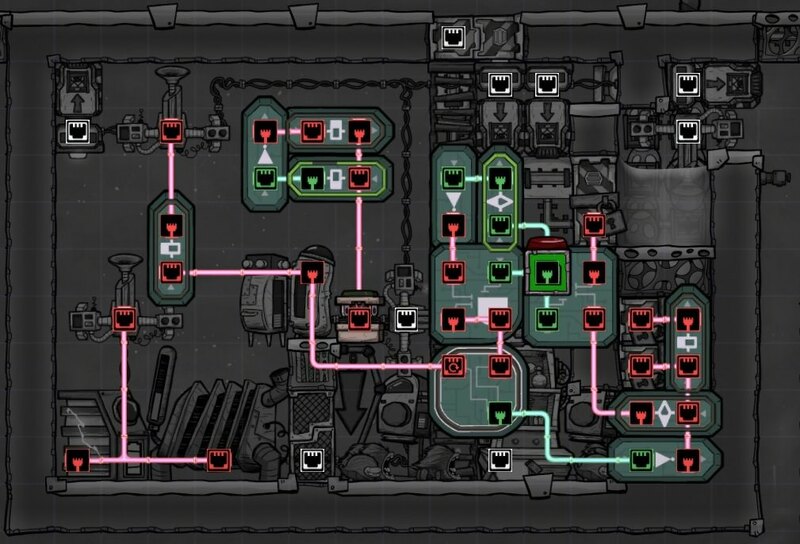 Trust me to find a way to over-complicate something as simple as "put the coal in the generator". 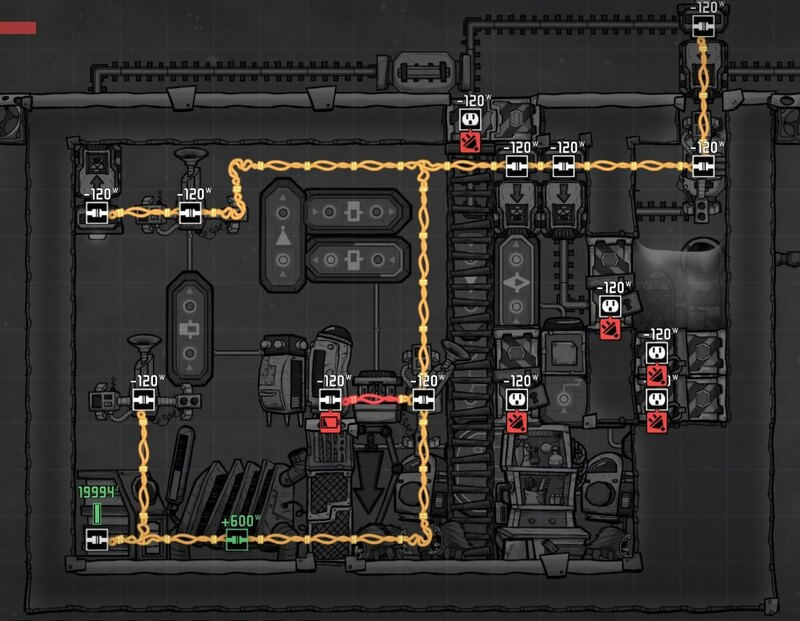 In my defense, I only added the pneumatic door after designing the coal sweeping system.